Beauty Berry: Not Just a Weed. Insecticide, Jams, and Native Landscaping. 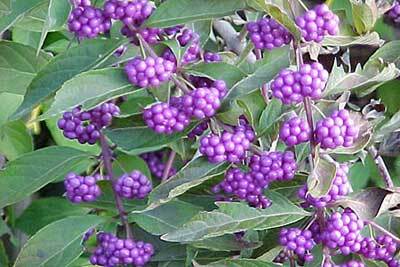 Callicarpa Americana more commonly known as Beauty Berry is one of the most easily recognizable backyard plants. It grows pretty much anywhere, and most people think of it as just a weed. It is easily identified by its bright purple berries, and due to its color, most people think it is poisonous. However, this is incorrect. Not only is beauty berry not poisonous, it has several household uses. Despite their bright purple color, the berries on a Beauty Berry bush are edible. They aren’t the most delicious fruit, and when raw, their flavor is somewhat astringent. However, the berries make a great jam. Adventurous eaters can find recipes for this jam online. The jam has a mild flavor, and tastes like a mixture of muscadine and apple jelly. It makes a great gift as it is something that you can’t find in stores. Another use for the plant comes from its leaves. The leaves can act as an insect repellent in a pinch when they are broken and rubbed against the skin. How to identify a Beauty Berry plant: The most obvious identifying feature of the plant is the bright purple berries, which start off white, and gradually turn purple as they ripen. When the berries aren’t in season, the plant can also be identified by its leaves. The leaves are large with serrated edges, and feel fairly rough to the touch. On the stem, they grow in pairs opposite from each other. In Florida, the Beauty Berry produces twice a year, once in spring, and once in fall. Thanks for the recipe Stefanie! I so love the Beauty Berry bush. It takes me back to my childhood when my “adopted” grandmother, Florence, introduced it to me. My real grandmother died when I was 14, and “Miss” Florence just took over and taught me everything that my granny couldn’t. “Miss” Florence lived to be 98 years old and I cherish every moment we had, and those that my Granny and I shared with her. They were both truly remarkable women! For Some reason, these plants also grow well in San Antonio & central Texas, not just Florida. I’ve been growing beauty berry in Florida for years. I cut it back every year and now it’s beautiful. You also see it quite often in the woods growing wild. and..I Live In Southern Alabama….. I just saw one for the first time under my grape vines in nc. I,m gonna convince the wife to try a jelly since she is make jelly from the grapes. we have been watching these bushes this year. I first noticed them when they had light green colored berries and now the berries are a vibrant purple. We see them in the woods all over south Mississippi. I have seen these growing wild while hiking in the woods. Is it possible to get a cutting and grow them? I would love to have some in my yard. If so, how would this be done? Well, I too am shocked that I can eat these! Wow, how cool? So I am from Texas, but I just bought acreage in the mountains of Southeastern Oklahoma, I was up the two weeks ago working on the property cutting these plants back on the road into the property and I said; they look edible, but if I ate one, I will surely die! LOL I plan to try them when I go back up and discover all the wild foods in the forest, of course I have a guide! HOW CAN I KEEP THE BIRDS AWAY FROM MY BEAUTY BERRIES SO BDEAUIFUL BUT GONE IN A FEW DAYS BECAUSE THE BIRDS HAVE EATEN THEM? I had a plant growing in the front yard near the large electric box in front of my new mobile home. I didn’t know if it was a weed or not. This was in the winter when it was not very bushy. so I cut it back and waited and now I have this beautiful bush with these bright purple berries. My neighbor saw it and said it was just a weed. I liked this weed and was not going to cut it down. Then I discovered it was a beauty berry bush. I LOVE it and let the birds eat the berries. There are plenty there. Will be there permanently! I found beauty berries at Nancy Ward’s grave yesterday when we visited, I was just wondering if they are wild or if they were planted. And if anyone knows if I eat one will I die? I saw a bunch of these beauty berries in and around Anastasia National Park in St. Augustine. Our horse goes crazy over eating the berries once they turn purple, are they edible for horses too? Wow! Had no idea these berries in my backyard had so many uses!